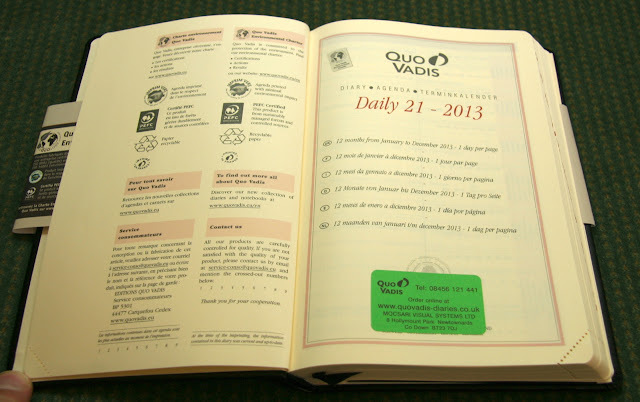 Huge thanks again to Steve of Philofaxy for this guest post on his new Quo Vadis Habana Daily 21 day per page diary! Hello again, I'm making a bit of a habit of appearing on Laurie's blog! Anyway following on from my quick review of the Exacompta Journal 21 that I received from Quo Vadis USA, for 2014. I started to get pangs for wanting something similar for 2013. Yes I know it's a bit late, but I was sure that there would be something still around in May. After seeking Laurie's advice, she suggested the Habana Daily 21, again about A5 in size and also day per page which was what I was looking for. Again like the Journal 21 I will be using this as my journal not as a planner. Keeping the two functions separate really helps having two different formats in terms of layout and in my case ring bound and bound... best of both worlds may be. Luckily Quo Vadis in UK still had some stock left and the shipping cost wasn't too outrageous so I just bit the bullet and ordered one. I could find some alternatives in France which might have been cheaper, but not Quo Vadis, so as I'm a bit inexperienced in this area I thought I would stick with the recommendation. The diary arrived nicely packaged on Friday and I offered to do this review before I start writing in it. 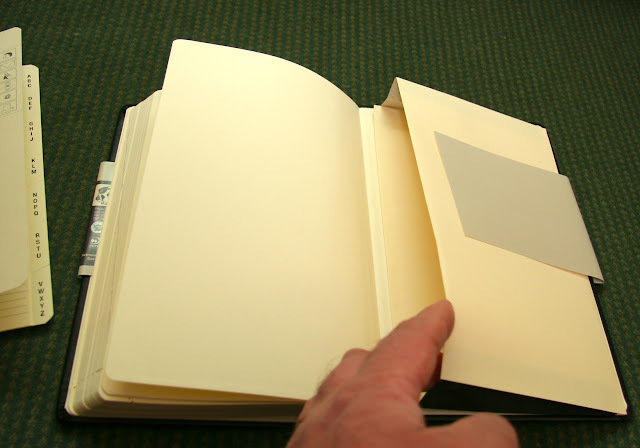 The cover is quite thick, so it should offer good protection to the pages over time. In my case it will sit on my desk most of the time. 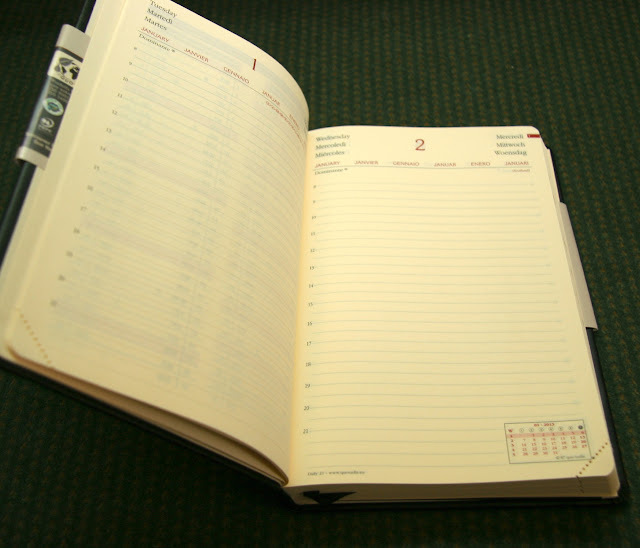 It has an elastic closure band similar to the Rhodia Web notebooks. And the year and QV symbol are embossed in to the surface. The cover is also available in red, orange as well as black. 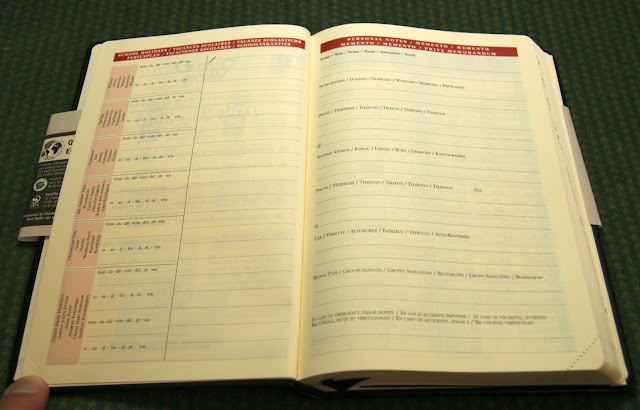 A sort of title page greets you when you open up the diary with details about the company and contact details in French and English. Following on there is a page for tabulating school holidays and noting your personal details, addresses and emergency contact details. 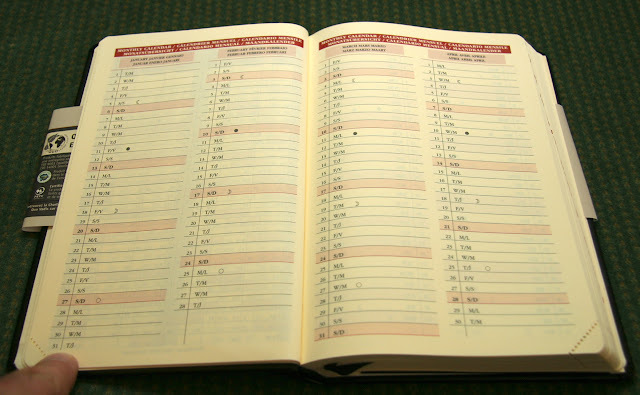 The bulk of the diary is in 6 languages, fortunately for me they are in the order, English, French then Italian, German, Spanish and Dutch. The first two being the most familiar for me thank goodness! I will let you decide how they decided the order, may be it was a bit like the Eurovision Song Contest! The next double spread is a 2013 year planner, this includes the week numbers. 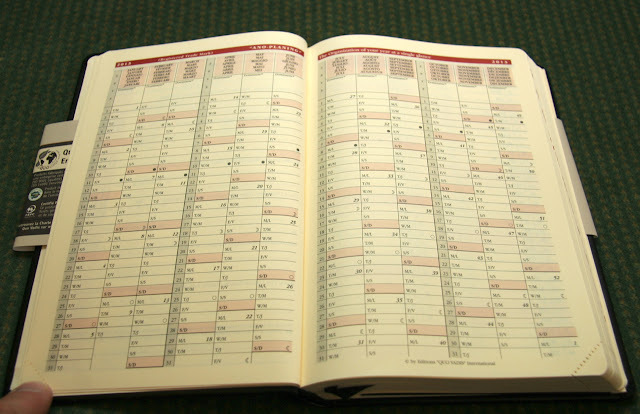 We then go in to month planners with two months per page, the symbols indicating phases of the moon. Then we get in to the daily pages, each double spread is in the same layout through out. The actual day, date and month at the top. Then times from 8am to 9pm down the left hand side with lines ruled in half-hourly intervals. 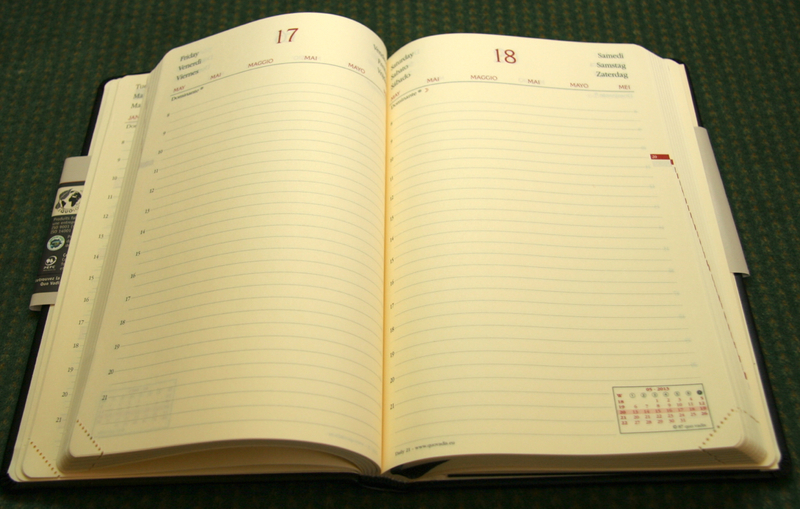 In the bottom right hand corner of the right hand page is a small monthly calendar . Bank holidays are also indicated at the top of the page in a small font so as to not intrude in to the page. Again all six languages are used at the top of the page, but again I'm happy with the layout because English and French are in the top line of this group. The week numbers appear as a printed tab on the right hand page. Not shown but there is a ribbon page marker that is attached to the spine of the diary. Additionally the bottom corner of each page is perforated, so you can remove the corners as you progress through the year. Having both of these will prove useful to me which I will explain in a moment. The diary finishes on 1 January 2014, they haven't learnt the trick of including a notes page where 29th February would be as in the Journal 21. Not shown but there is then a 2014 year planner, in the same format as the one at the front of the diary. 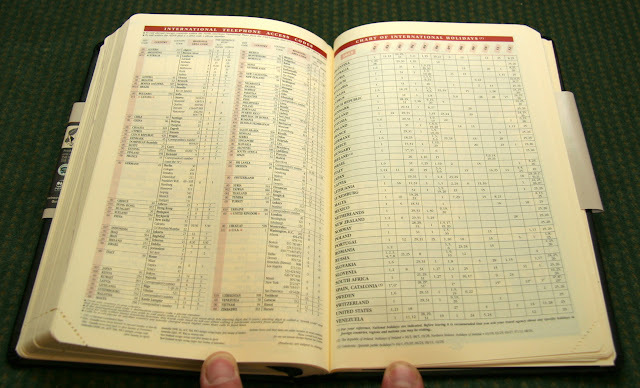 We then have a conversion tables page. 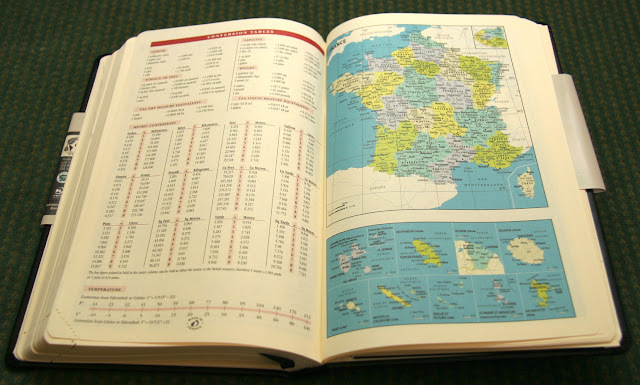 And then we start in the maps section with some coloured maps of all the European countries, leading off with France and its dependants. This tucks in to a reasonable size gusseted pocket which is fixed to the back cover. I expect you can use this for keeping receipts and such like. 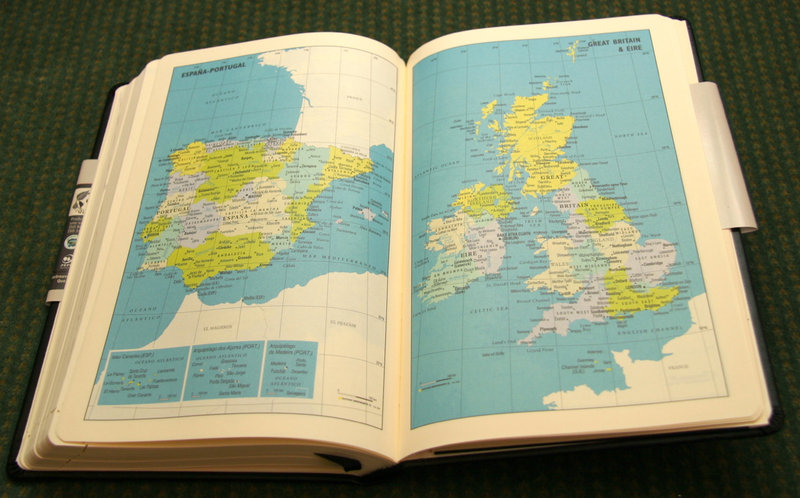 So that concludes the make up of this diary, it's quite a sizeable book, but one I think I am going to enjoy writing in. The paper is silky smooth and I can't wait to start using it. So far this year I've been recording some notes each day in a separate diary insert in my A5 Filofax, but it is a Week on Two pages format. What I'm intending to do with the Daily 21 is to swap over to it for the remainder of the year. But I will most probably transfer my dairy notes from the Filofax insert to the Daily 21, but that will obviously take some time to do. So I'm thinking of using the ribbon page maker to show the current day. And I will take the corners off of the pages to show my progress on transferring my diary across from the Filofax to the Daily 21. I'm sure having a separate book and a bigger page format will encourage me to write more down each day, it will also encourage me to keep my desk a little tidier so I can have both my Filofax planner open and my diary open at the same time! Using this diary for the remainder of the year will get me ready for 2014 when I hope I will have learnt a lot about keeping a journal and it will become quite an enjoyable pastime. Again thank you to Laurie for the recommendation and for letting me do the guest post. I will pop back and answer any questions if there are any. PS Laurie here: just wanted to let you know that Quo Vadis UK ships worldwide, so even if you're not in Europe you can get these European planners/ diaries at http://www.quovadis-diaries.co.uk/ and you can click here to see their remaining 2013 diaries. Many thanks again to Steve for this excellent guest post! Who knew there were so many different kinds of notebooks out there! Same size as Habana?? If so--NEED! Hi Rori, the Daily 21 is the same size as the Journal 21, same size as a large Moleskine. The large Habana notebook is bigger than this by an inch or so. Hope that helps! 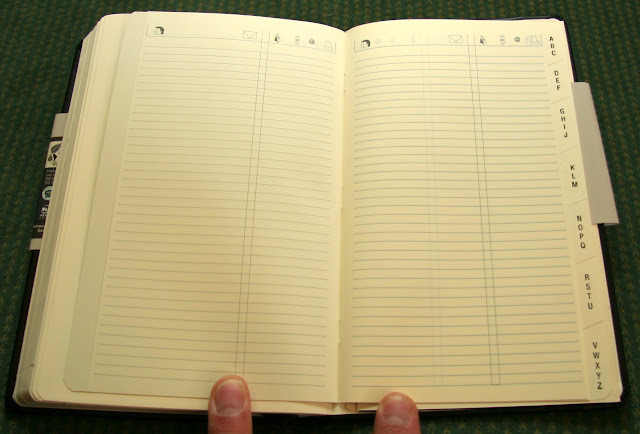 To me the paper quality of this diary is very unique - silky as you said - and I am looking for a notebook with the same paper quality. Are you aware of any? I have the habana notebook but its not as silky as the diary. Any of the Clairefontaine/ Quo Vadis/ Rhodia papers will have a similar finish, but because the Journal 21 uses the green tinted paper none of those will be exactly the same. Sorry the Habana Daily 21 does not have the green-tinted paper that the US version of the Journal 21 has. 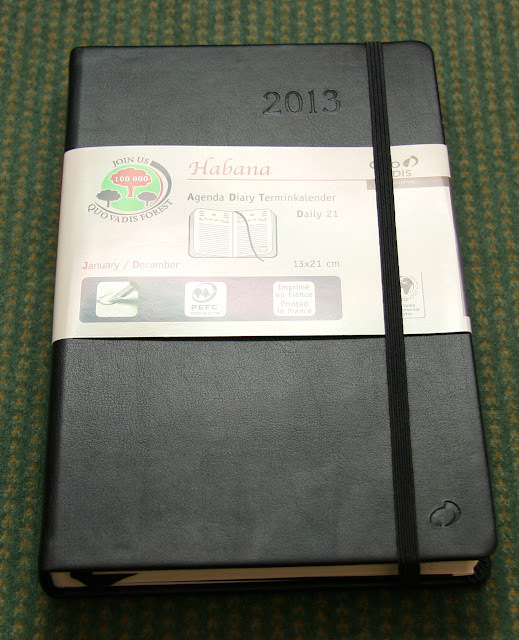 In fact, I don't know why the Habana diary and notebook paper wouldn't be exactly the same.